A soul-sucking ‘dementor’ wasp, a stealthy wolf snake and the world’s second longest insect are among the 139 new species discovered by scientists in the Greater Mekong region in 2014, including 28 species in Laos. The species are described in a new report, “Magical Mekong,” released today by the World Wide Fund for Nature (WWF). Vientiane, 27 May 2015 – A soul-sucking ‘dementor’ wasp, a stealthy wolf snake and the world’s second longest insect are among the 139 new species discovered by scientists in the Greater Mekong region in 2014, including 28 species in Laos. The species are described in a new report, “Magical Mekong,” released today by the World Wide Fund for Nature (WWF). In total, 90 plants, 23 reptiles, 16 amphibians, nine fish, and one mammal are detailed in the report. The species in Laos include 17 plants, 9 reptiles, one mammal and one fish. Of particular interest is the discovery of a bent-toed gecko (Cyrtodactylus vilaphongi) in Luang Prabang Province, the 10,000th reptile species to be officially identified in the world. The gecko was found just 500 metres from a cornfield, indicating how little we know of some species living exceptionally close to us. 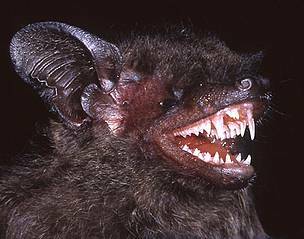 Another fascinating species known from three locations in both Laos and Vietnam is the long-toothed pipistrelle (Hypsugo dolichodon), a species of bat that has extra-large fangs. Scientists believe these impressive canines may have evolved to allow it to prey upon larger or harder-shelled insects around the karst caves and forests the bat calls home. A new walking catfish (Clarias serniosus) was also found in a tributary of the Xe Pian River on the Bolaven Plateau in Champassak Province. Within the wider Greater Mekong region, new species include a feathered coral whose nearest relatives live in Africa, four moths named after Thai princesses, a colour-changing thorny frog and two orchids discovered already being illegally traded. This brings the total new species discovered in the Greater Mekong, which includes Cambodia, Laos, Myanmar, Thailand and Vietnam, to 2,216 between 1997 and 2014 – an average of three new species a week. Thailand’s Ampulex dementor wasp, which was named after the soul-sucking dementors from the Harry Potter books. Its venom turns cockroaches into passive zombies, unable to control their own movements before they are devoured alive. A crocodile newt species in Myanmar may also be in trouble as its core breeding habitat – a pond on a university campus – is threatened by a construction project. The newt is already in demand from the international pet trade, as two specimens used to describe the species were found in Japanese pet stores. Also on the market are two new orchid species discovered in Bangkok’s famed Chatuchak Market. The scientist who discovered them almost didn’t publish his find, afraid that attention would spell doom from aggressive collection, but equally afraid that not publicizing them would prevent them from gaining conservation protection. The world’s second largest insect, a stick insect that measures 54 cm, was found less than one kilometre away from a village and rice paddies in north Vietnam. A stealthy wolf snake with a distinctive “flying bat” pattern that helps it blend in with the tree bark and mosses that characterise its home in Cambodia. WWF believes in order to meet these challenges increased capacity and support for rangers is urgently needed in the region’s protected areas, along with better law enforcement in the markets against criminals in the illegal wildlife and timber trades. A commitment to developing a green economy that prioritizes saving wildlife habitat is also crucial, with countries cooperating across borders to make sustainable decisions on issues that negatively impact the region’s biodiversity. Cyrtodactylus vilaphongi, the 10,000th reptile species discovered in the world.